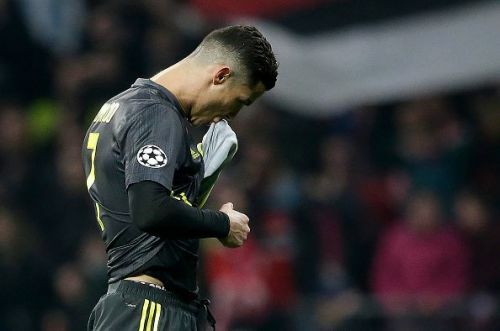 It was quite surprising to see one of the greatest players of all time, Cristiano Ronaldo, failing to score against Atletico Madrid in the Champions League Round of 16. This has added immense pressure on Massimiliano Allegri, who would be desperate for a huge turnaround in the return leg. Ronaldo had fixed his place at Real Madrid as a striker who sat near the penalty box. The reason he was able to score a lot of goals at Mardid was because his team often fed the ball to him and he could then use his expert finishing skills to find the back of the net. That has not been case at Juventus, as he is now required to show his versatility by roaming around the pitch and helping his teammates set up goals. In Serie A he has been successful doing that in a lot of matches, but in the Champions League there haven't been enough holes in the opposition to create opportunities. Ronaldo has scored just one goal in five matches in Europe this season, which is pretty much disappointing for a quality player like him. It is a fact that when Ronaldo was at Madrid, every time he faced Atletico Madrid he destroyed them. And one of the reasons for that was the tight marking of Ronaldo by Atletico manager Diego Simeone. Marking Ronaldo is often rendered useless as he can easily break through by constantly moving in and out around the final third area. So this time, Simeone focused more on attacking and didn't bother to implement tight marking on Ronaldo. Due to this, Atletico had no problems dealing with the other Juventus players, which in turn reduced the number of chances created. Paulo Dybala has similar characteristics as Lionel Messi, and that's the very reason why both Messi and Dybala don't play well together at Argentina. To get the best out of Dybala, it is necessary to give him a free role so that he can help his team create and set up more goals. After Ronaldo came to Juventus he took that free role, due to which Dybala had to play as a left winger. And that is not an ideal position for him to create chances. That again hampered Ronaldo's goal-scoring exploits, and Juventus now have a mountain to climb to stay in the tournament.